Welcome to the sixth edition of PuzzleNation App Reviews! Today we continue our quest to explore the world of puzzly games and apps for your tablet or smartphone! 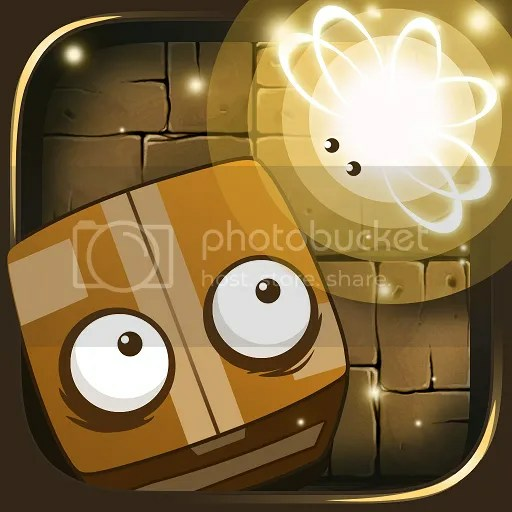 Our resident App player and puzzle fiend Sherri has another intriguing game for us today, so let’s get down to business and dive into her review of Paper & Light for iPad and iPhone! If you enjoy mazes, then Paper & Light is the game for you. It is an iOS game in which you are a cardboard box who must navigate your way around obstacles to the exit. This is a very cute game. You play a cardboard box, and your friend is a bright firefly. Your goal in each level is to find your way around other boxes, toolboxes, and various other obstacles to the exit. The firefly is quite helpful, as it’s your only source of light. 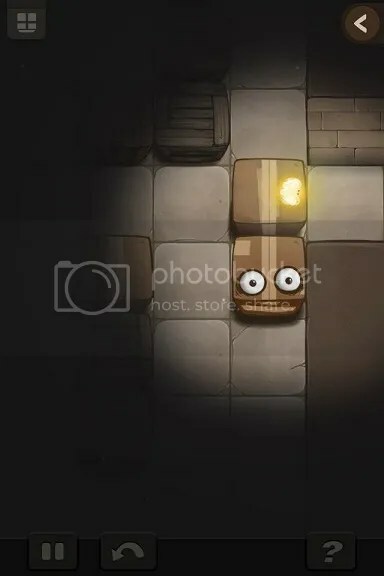 While you only have a narrow range of light from the firefly, you can switch between the cardboard box and the firefly as needed. The game is divided into chapters and there are 15 levels in each chapter. As the firefly, you can scope out the area to plot your route to the exit. You earn stars for not using the firefly, but you can redo the level to get the star. For collecting 12 stars in each chapter, you earn a special reward. I played through the first chapter, The Basement. To open later chapters, you need to complete a certain number of levels. I was pulled in by the cute graphics. I enjoyed playing the game. The levels were laid out in a pleasing manner and became increasingly more difficult. A big drawback, though, is that you can’t move the box very quickly. My wrist became quite sore as I was playing. The mazes became more and more challenging as the game progressed. It did become a bit monotonous, and my wrist hurt after a while, but it was still an enjoyable way to pass the time. Figuring your way out of the mazes really worked the brain. Enjoyability: 3/5 — If you enjoy mazes, this is the game for you. How well puzzles are incorporated: 4/5 — This is quite a puzzly game. You need to plot your path around the obstacles well. Graphics: 3/5 — The graphics are simple but cute. The eyes on the cardboard box move when you move it, and the firefly flutters. The obstacles have some nice detail. 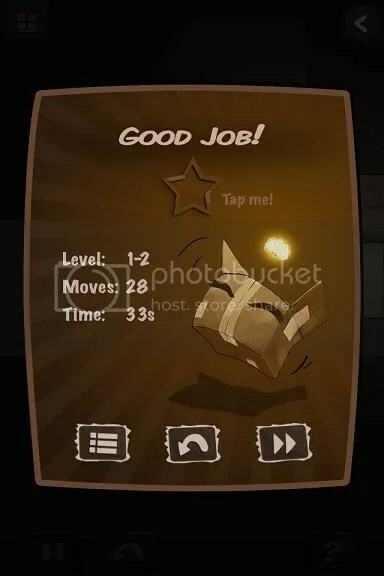 Gameplay: 2/5 — The box doesn’t move very quickly, so your wrist can get quite sore trying to reach the exit.